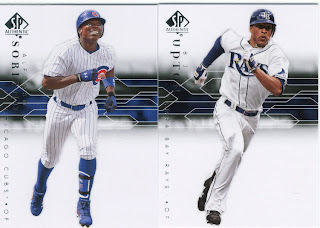 Despite having no business purchasing anything right now, I felt like eBay needed a little spice in the category department so I picked up a couple of packs of the new SP Authentic. The box in BC was sealed and opened right in front of me so I figured I had a better shot now at getting something good. 24 packs per box, 5 cards per pack and 3 rows of 8 in the box. I picked the 4th pack from the top of each row yesterday, no auto's or game used cards, but I got 2 Yankee Stadium Legacy cards, 3 Marquee Matchups, and.... a Pujols base card. The cards themselves are not very appealing looking, they are quite boring actually. 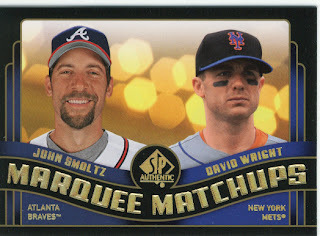 The Marquee Matchups are pretty cool, but they are the replacement to last years Authentic Speed/Power inserts. The pictures on the MM's are nice head shots with a short story on the back. Today's trip to the store yielded the same results, 2 Yankee Stadium Legacy and 3 MM. I took the 3 bottom packs today, and the only packs missing were the 3 I got the day before. I'm sorry I didn't go second from the bottom because that was my first instinct. Everything except the Yankee Stadium Legacy, Pujols, and Russ Martin are in the eBay store. We still have the case of 2008 UD Piece of History to break, which I am hoping we get to soon to recoup some of the cash we spent. I'll keep you posted on that. In the meantime, click on the link to the store, check out the new items and if you click through to the store and make a purchase be sure to tell us to get your free gift.